We were really sad to leave Fowey Hall - A magical place where nothing was too much trouble, children were welcomed with open arms, and it all felt like one big happy family. But we were also excited about the next place on our road trip, Tregenna Castle. After a stop at Restormel castle (An English Heritage site en route to where we were were heading), we arrived at Tregenna to stunning views of St Ives. From that point on things have gone downhill today. It is now past 10.30pm and we have only just managed to settle the kids to sleep. I think we were thoroughly spoilt at Fowey Hall because, the stunning views excepted, we were pretty much underwhelmed by the rest of Tregenna castle. They didn't have our booking properly recorded so check-in became a hassle, the 'heated' outdoor pool was positively cold, and the layout of the apartment is so poorly thought out that even though the kids are now finally asleep, as soon as one of them awakes in the morning, chances are they all will. J's usual wake up time during the summer months is before 5am so I am worried about just how much sleep we will get. We are in a separate block away from the main hotel. The apartment itself has a Center Parcs feel to it, being surrounded by trees and the golf course is nearby too. But unlike Center Parcs, the layout is far from family friendly. There is a pull out sofa downstairs for the kids, and a mezzanine floor for mum and dads bed. But with only one TV (which is downstairs), once the kids are in bed, we can't even watch telly. Miss T is in her koodi bubble travel cot upstairs so we don't want to disturb her either. We've ended up having to separate the boys with J upstairs at the moment because they were squabbling with their shared sofa bed. With self catering facilities in our apartment, we are thinking that we might have breakfast here rather than in the hotel. So Richard popped out to get some basic groceries. 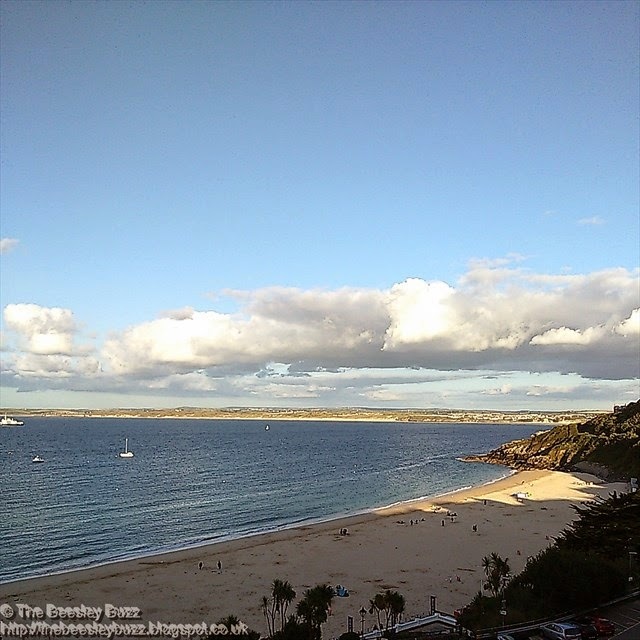 Turns out its quite tricky to find supermarkets in St Ives (well ones that are open beyond 8pm) and apparently there are no petrol stations here either. Met a lovely woman at the swimming pool who was telling me about the Porthminster restaurant being one of the best places for Fish and Chips in the country. If we'd known about it earlier then I'm sure The Brilliant Chef would have appreciated a visit there but checking on their online booking system, we'd left it too late to book a table. We're hoping to explore some of the grounds tomorrow. Apparently, according to the same lady at the swimming pool, there is a kids play area on the grounds. We also booked ourselves in for a seal spotting trip tomorrow down in the harbour. D was really keen to do the fishing trip but we've persuaded him that seal spotting will be most fun for us all. Day 4 of our Road Trip - Written up on Friday 22nd August 2014.